Mulling over Disney’s magical Zootopia prompted me to check in with the American Conservative’s resident culture warrior, Rod Dreher and, sure enough, there was this gem with the pop-conservative click-bait title, “What If Diversity Is Our Weakness?” The article is essentially Dreher quoting a reader’s comment from a previous article, all the while channeling Nelson from The Simpsons as he points to the “left” and ha-has. The source of all this glee: a challenge to the cherished notion that encouraging interactive diversity will result in social harmony. But he cites no mere trolling from the unwashed commentariat. No; his citation is powered by a liberal political scientist from Harvard, Robert Putnam, whose research into diversity in 2007 yielded the counterintuitive result that diverse communities exhibited decreased civic engagement. People vote less, volunteer less, trust each other less in diverse communities compared to homogenous communities. The rhetorical headline makes it clear that with diversity suitably chastened, Dreher is free (as if he wasn’t already!) to advocate for monoculture without being dragged down by liberal critiques of homogeneity (read: white, male, heterosexual). He can be perfectly happy in his very own little bubble – in his particular case a project he calls the Benedict Option where he can be insulated from anyone who doesn’t fit into his Orthodox Christian worldview. But the results of Putnam’s research aren’t an end to the question of diversity; they describe, in fact, the very challenge diversity poses by its very nature and ubiquity. How, indeed, do we encourage the positive civic interactions capable of overcoming the dissociative factors at play in our multifaceted communities? How do we even sensibly define diversity in type (e.g. ideology, ethnicity, economics, etc. ), scale (family, community, city, region, state, nation) let alone policy? The question is fundamentally personal; a matter of our approach to whether we approach diversity with curiosity, detachment or, in some vocal quarters, revulsion. For an example, we could look to the controversy surrounding North Carolina’s law that bans ordinances denying discrimination against LGBTQ people and directly prohibits transgendered persons from using bathrooms according to their gender identity. The law is partly the product of dangerous misinformation and fearmongering about transgendered people (see Media Matters' debunking here). Broadly, however, it’s an expression of the religious right’s hostility towards LGBTQIA identities – e.g. sinful offenses to God, perversion of nature, heterosexual familial breakdowns. It can only be considered hostility when it isn’t enough to accept that legal doesn’t mean mandatory; to the religious right, what is deviant in their view must be forbidden to everyone. 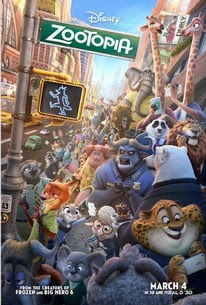 It comes as a surprise that Zootopia, a Disney film, would offer a remarkably nuanced perspective on the challenges inherent in a diverse society, all the while delivering a crackerjack conspiracy thriller and buddy movie. The film’s creators previously offered us Frozen, a welcome call to girl power that nevertheless came across as glib and, worse, perpetuated Disney’s obsession with casting women as princesses. (What sort of subtextual goodness would have infused Frozen had its sisters been peasants?) That Zootopia dispenses with the fetish for aristocracy and instead gives us a proletarian view is a refreshing change on its own. 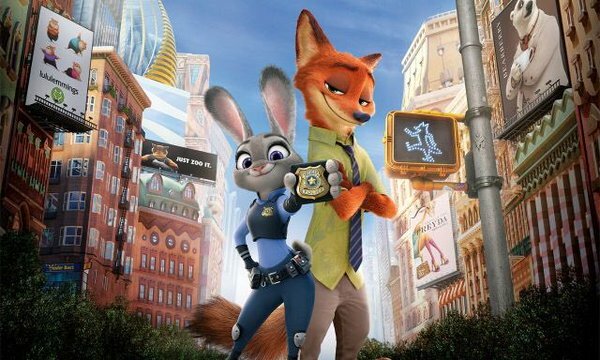 The film centers on Judy (voiced by Ginnifer Goodwin), a rabbit whose keen sense of justice leads her away from carrot farming into the unlikely profession of policing – unlikely, because in Zootopia’s world small mammals aren’t generally considered physically matched to the demands of police work. A lesser movie would have dwelled in Judy’s challenges at the police academy, cataloguing every act of bullying and condescension from teachers and fellow trainees. But the filmmakers breeze through Judy’s challenges in an exciting montage that culminates with her proud graduation as the first bunny cop before launching into the film’s narrative. Unsurprisingly, being a trained and top-of-the-class graduate earns her no respect in the precinct to which she is assigned. The police chief, an imposing bull voiced with wonderful grit by Idris Elba, even assigns her to parking duty on her first day. It says a lot about Judy’s character that she commits herself to excel at the less-than-ideal assignment. She does excel, but by the second day we can sympathize when the job leaves her demoralized. Who wants to punish people for parking infractions and get abused for it? The situation changes when she unwittingly helps a sneaky fox, Nick (voiced by Justin Bateman), pull a con on an ice cream store owner. She gets the upper hand on him quickly enough, but the stage is set for an oil-and-water partnership when a missing person’s case connects to a series of frightening incidents where Zootopia’s carnivores revert to their primal states. At stake: the civilizing influence that redefines the predator-prey relationship as one of peaceful co-existence. Zootopia is exceptionally well-conceived and executed with superb voice work and animation, as funny as it is heartfelt, and inspiring for featuring a female heroine defined by her blend of kindness, toughness, and smarts rather than the usual romantic tropes. Cinematically, it’s one of the finest animated films in recent years solely on the basis of his rich characters a sophisticated narrative. Layered interpretations aren’t necessary, of course, but when it comes to reading the film from a political perspective it stands out above the usual genre feel-good messaging by refusing to reduce its characters to stereotypes or allowing itself to be glibly mapped onto the conservative/liberal dichotomy. A lesser film would have sorted characters into unabashed racists and their victims, and the big villain would have been some sort of Trumpian blowhard. But every principal character is a nuanced mix of nobility, prejudice, wisdom, ignorance and righteousness of varying degrees. The difference lies in how each chooses to confront the legacy of a savage past: can predators evolve beyond their killer instincts? Judy and Nick – the rabbit and the fox – form a credible and touching friendship from a partnership of convenience, and in their relationship we have a positive, but by no means bump-free, response to the challenges of diversity. (It’s interesting to note that what separates them, more so than their species, is their positions as cop and criminal.) In the film’s startling villain, we find a destructive response, not unlike the rabid right-wingers who denounce Muslims and Mexicans, that illustrates how even understandable fears can upend empathy and moral reasoning. Ultimately, Zootopia illustrates the take-away from Putnam’s research: we live in a diverse world, and whether we live well or succumb to conflict depends on our willingness to embrace that diversity and make it work. As the RNC convention demonstrates, with supremacists like Rep. King proclaiming that capital-C Civilization owes its success to white people, America has not freed itself from its legacy of racism. This is the context for culture warriors like Dreher, who fail to understand both the distinction and overlap between overt discrimination among individuals and the institutional discrimination of white heterosexual male privilege. In the end, though, it comes down to will. As reactionary conservatives and Trump’s New Republican Party – an expression of fundamental right-wing angst – prove, some people just don’t want to get along. A film alone may not change minds, but films like Zootopia that can deliver terrifically entertaining stories with nuanced cultural commentary go a long way towards fostering a better culture.